Beware: GLUT's special() callback is called repetitively when the press is hold down. There are several ways to position the (X,Y,Z) axis triplet. 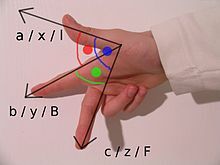 right-handed / left-hand : OpenGL and Blender use a right-handed coordinates system, which means you can represent it using your right hand, with X on the thumb, Y on the index, and Z on the middle finger. A left-handed coordinates system, as used by DirectX, can be represented similarly using the left hand. the camera is in Y-is-up, so if you use a Z-is-up coordinates system, by default the camera is at (0,0,0) and it faces the bottom. This is quite confusing when rotating the camera, because, for instance, if your camera is looking on the horizon towards the Y axis, and you rotate on the Z axis to look left or right, you'll actually rotate the view on the Y axis (barrel roll). When transforming the camera, you'd have to imagine that you shoot the video from your feet. Consequently we'll stick with Y-is-up in this book. There's no built-in concept of camera in OpenGL. We have to somewhat cheat to implement it. Our technique is the following: instead of thinking how to move our camera in a fixed world, we're thinking how to move the entire world around our camera. For instance, moving the camera for 3 units on the X axis is the same as moving the whole world for -3 units on the X axis. Same for all other axis and for rotations. Keep this in mind when working with the camera. The end-result will feel completely intuitive, but whenever you work with the camera, if you forget that we've been cheating in the first place, you'll get the wrong transformations. in the case of a camera translation, don't forget that we cheat and move the whole world, not the camera; consequently the above meaning is reversed for the world2camera matrix. while with the second form your will translate the camera forwards (along world's X axis).